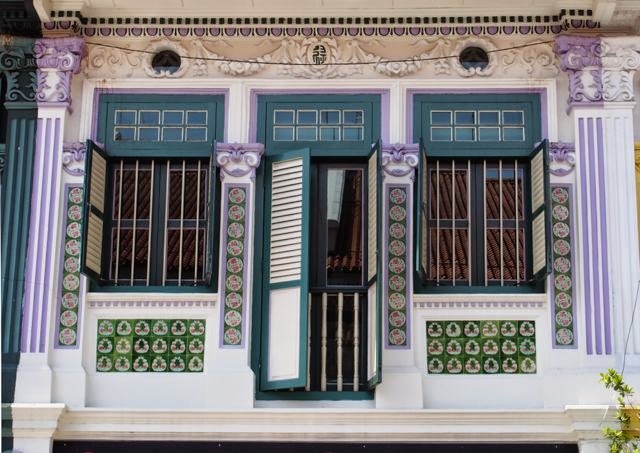 Singapore: Joo Chiat Road's Chinese Baroque & Malay market. A heritage district in Singapore without malls or tourists. Most people only see Singapore as a glorified shopping mall. With good reason. 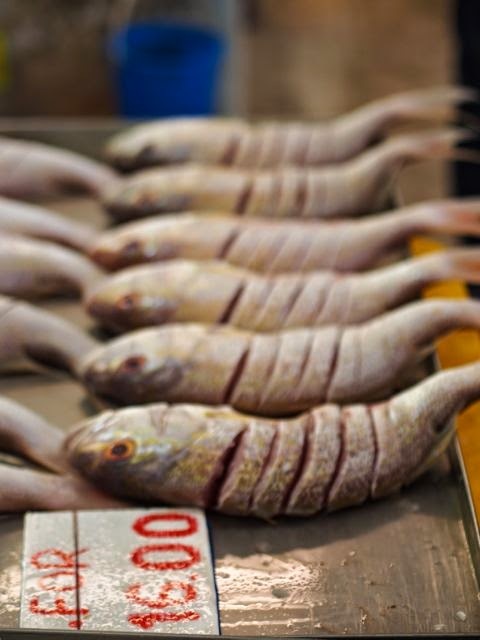 But if you're willing to dig a little deeper, you will find a rich heritage that blends Chinese, European and Malay influences into something uniquely, well, Singaporean. Joo Chiat Rd offers exactly this. Of course, even if there are no malls, the sidewalks are clean and the food is excellent. It is still Singapore after all. 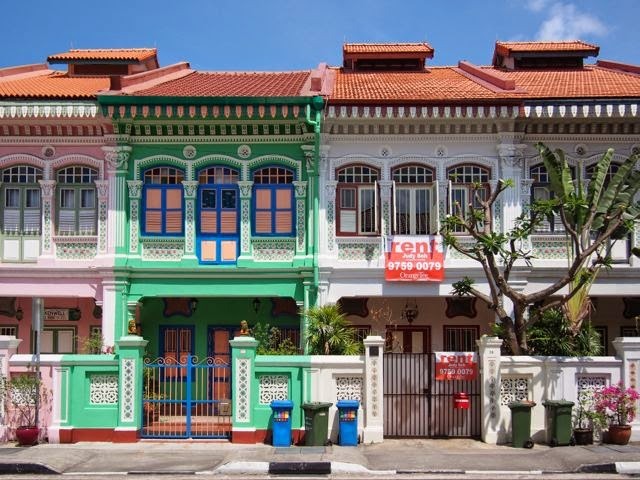 Joo Chiat Rd is at the heart of a neighbourhood called Katong, not far from the East Coast of Singapore island. Map. HAVING LIVED IN Singapore a number of years ago, I'm always annoyed when Westerners describe Singapore as 'not Asia' or 'Western'. These superficial statements belie superficial minds. Yes, it's easy to lead an air-conditioned lifestyle in Singapore, running from Mickey D to Starbucks, buying Western brands in glitzy shopping malls. But those who make the effort to dig a little deeper will find there's plenty of authentic Singaporean culture to discover. The Singapore government is partly to blame for this- for years the focus was on tearing down, rather than protecting old buildings. However, that has changed, and Joo Chiat Rd was declared a conversation district back in 1993. Joo Chiat has a long history (well, by Singapore standards) that goes back to the late 19th century when this area was full of plantations. One of the plantation owners was a Chinese gentleman called Chew Joo Chiat and when he bequeathed some land to the government for infrastructure development (funny how the history of Singapore is ALL about infrastructure development isn't it?) and in appreciation, the road was named after him. 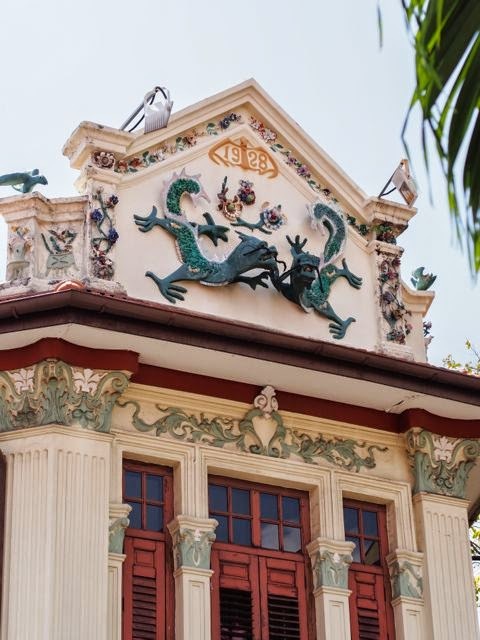 In the 1920 and '30's, Joo Chiat Rd became inhabited by Straits Chinese, also known as Peranakan, and Eurasian Christians and they built houses that blended Chinese and European styles. 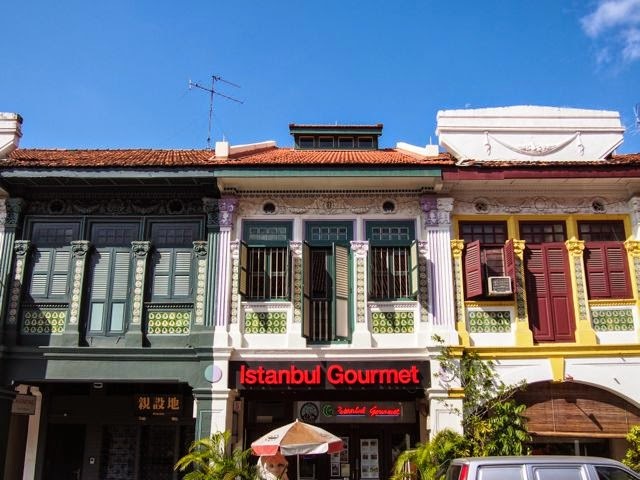 The most famous type of dwelling is the shophouse, which is ubiquitous in Malaysia and Singapore and combines, you guessed it, a shop (on the ground floor) and living quarters (upstairs). 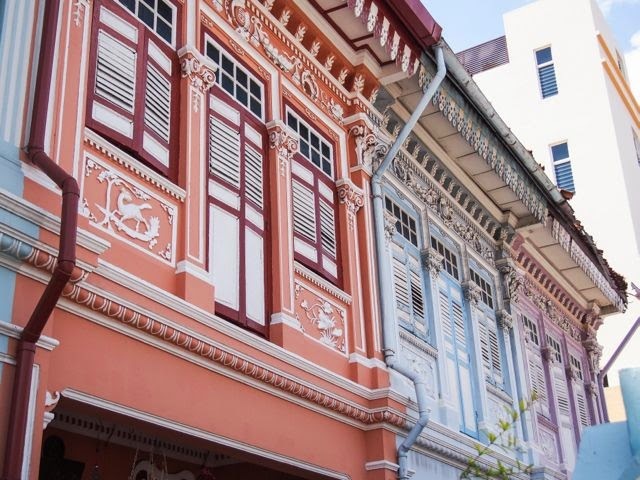 The Peranakan shophouses on Joo Chiat combine a European sense of urban space (sidewalks, tiled roofs, 2 stories high) with exotic colours and motifs. Some of them look like they have been designed by a wedding cake decorator rather than a classically trained architect. They are often gorgeous and whimsical fantasies. With the combination of European architectural elements and Chinese decorative elements, something developed that is sometimes referred to as Chinese Baroque. Imagine Louis XIV designing the set for 'Crouching Tiger, Hidden Dragon' in pastel and stucco. A classic example is on the corner with Koon Seng Rd, about halfway down Joo Chiat Rd. See those flying dragons? Chines Baroque with flying dragons. 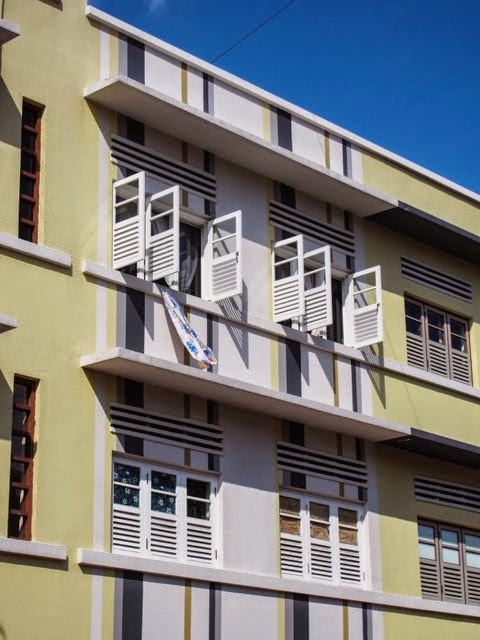 If you pop further down into Koon Seng Rd you will come across a picture-perfect row of terraced houses. Not shophouses- the people living here clearly didn't (and don't!) work in shops. These houses are among Singapore's most expensive real estate. Of course, as tastes evolved, so did architectural styles. After OD-ing on Chinese Baroque, architects went cold turkey with clean, cool minimalist Art Deco designs. Art Deco: keep it simple. 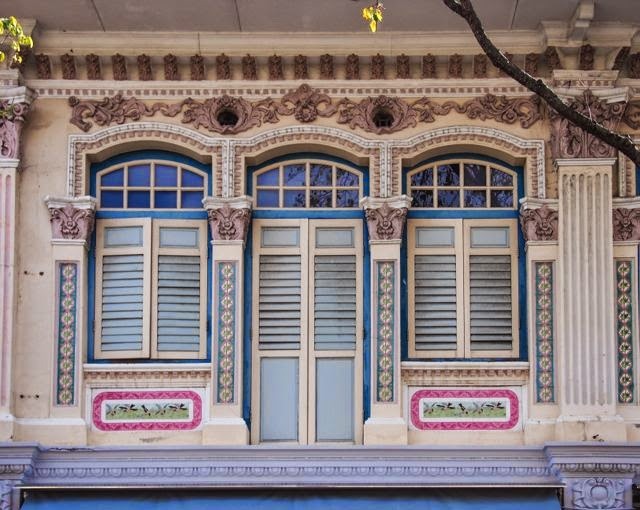 Traditionally, Joo Chiat Rd and Katong were Perenakan, and a number of Peranakan eateries remain. It's one of my favourite cuisines, combining Malay and Chinese influences. 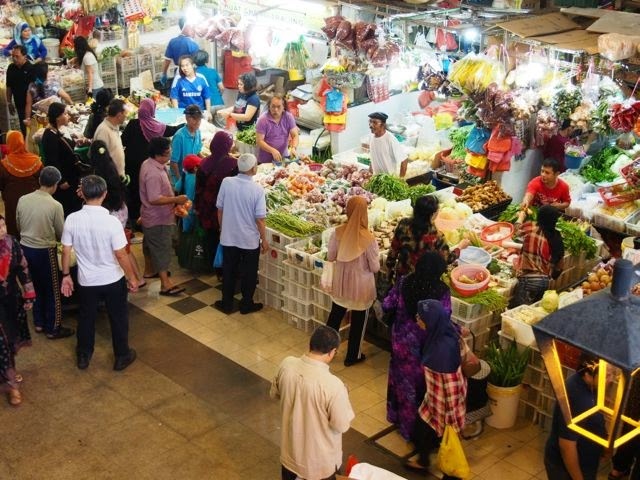 However, at the north end of Joo Chiat Rd you will walk straight into Geylang Serai Wet market, a focus for the Malay community of Singapore. 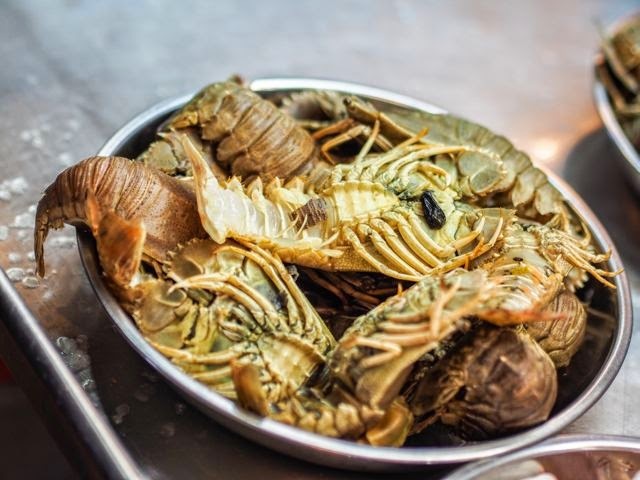 Here you will find ethnic Malays and Chinese mingling in search for the freshest rock lobster and other sea food, as well as a kaleidoscope of coloured fruits and vegetables. 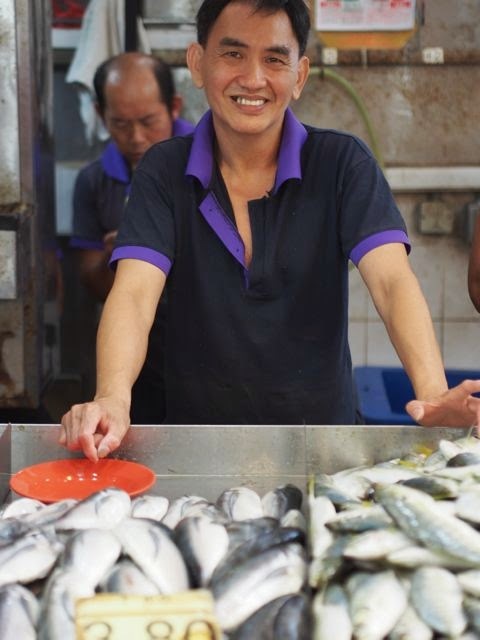 ...and a Chinese fish monger happy to sell her some. 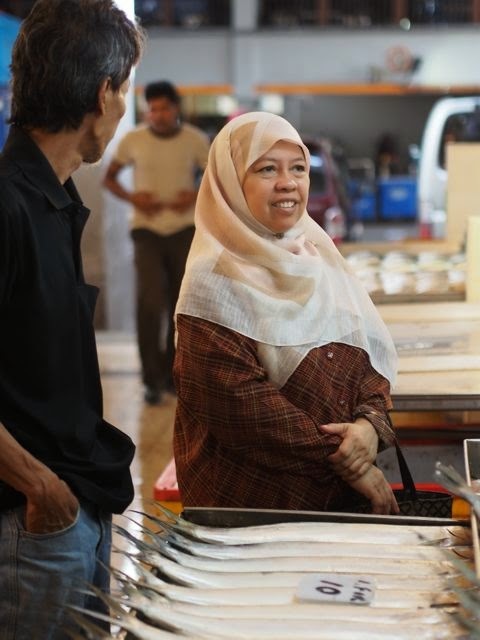 Upstairs is a food court that is predominantly Malay- great for Nasi Lemak, Pisang Goreng, and other Muslim specialities. Well, not by MRT. Or you can, but you'll have to walk a fair way from Paya Lebar MRT station. (I guess being relatively far from MRT is a good thing here). There are plenty of buses up Sims Ave. or down Geylang Rd. Thanks Aana! Glad you enjoyed Joo Chat Rd. Any other places you could share with us that are worth a visit and below the radar?